1. ...But on top of your feet is fine, for $140 a pair? In what is surely one strange pair of shoes, Nike has just announced they will release a new pair of golf shoes, inspired by the courses they will be played on. 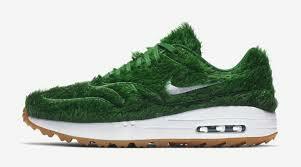 There's no word on when the Air Max 1 Golf "Grass" shoes will be made available but they're expected to retail for $140 US ($186 CAD), according to several media outlets. Would you ever consider buying these shoes? What a brilliant way to deal with "grass stains"
2. You're probably familiar with the saying "don't let the grass grow under your feet", which means, don't put off doing anything or don't waste time. 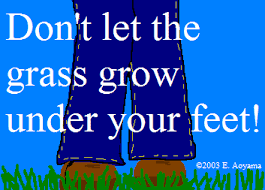 Grass seems to be the popular choice for quotes, popping up in many of our best-known ones. How many of these quotes have you heard? 3. 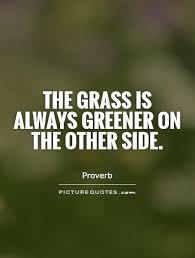 Of course, the most famous "grass" saying -- spawning many versions -- is "the grass is always greener on the other side". Do you use this expression, and have you ever heard any of these versions? I have used "the grass is always greener on the other side"
I have never used "the grass is always greener on the other side"
I have never heard the expression "the grass is always greener on the other side"
If the grass is greener on the other side of the fence, you can bet the water bill is higher. It's not that the grass is greener on the other side, it's that you can never be on both sides of the lawn at the same time. Even if you think the grass is greener on the other side, you're going to have to mow that side too. The grass is always greener over the septic tank. The grass is greener where you water it- not always on the other side!